Heat oven to 350°F (325°F for dark or nonstick pan). Grease 13x9-inch pan with shortening or cooking spray. Make and bake cake mix as directed on box, using water, oil and egg whites. Cool completely in pan on cooling rack. Remove cake from pan to cake board. Place strips of waxed paper or cooking parchment paper under cake edges. Frost cake with vanilla frosting, spreading frosting as smooth as possible. Place cake in freezer until frosting is firm. Meanwhile, place fondant on work surface (sprinkle surface with powdered sugar if fondant begins to stick). With rolling pin, roll fondant to 1/4-inch thickness (do not roll too thin or it will crack when assembling). Invert cake pan over rolled fondant to check that you have enough to drape. Roll fondant over rolling pin. Remove cake from freezer. Carefully drape fondant over cake, smoothing with your hands and shaping it to cake. Use sharp paring knife to trim excess fondant (set aside for future use). Remove waxed paper strips from underneath cake. Roll 1 piece of excess fondant to 1/4-inch thickness. Use paring knife to cut fondant into pocket (use man’s button-down shirt as template, if necessary). Use toothpick to create stitching detail. Brush water on back of pocket; place on cake. Roll another piece of excess fondant to 1/4-inch thickness. Using man’s button-down shirt as template, cut out collar. Place collar at top of cake. Reserve small piece of fondant to create polka dots. Knead remaining fondant with gloved hands until it softens. Use toothpick to add blue icing color until desired color is achieved. 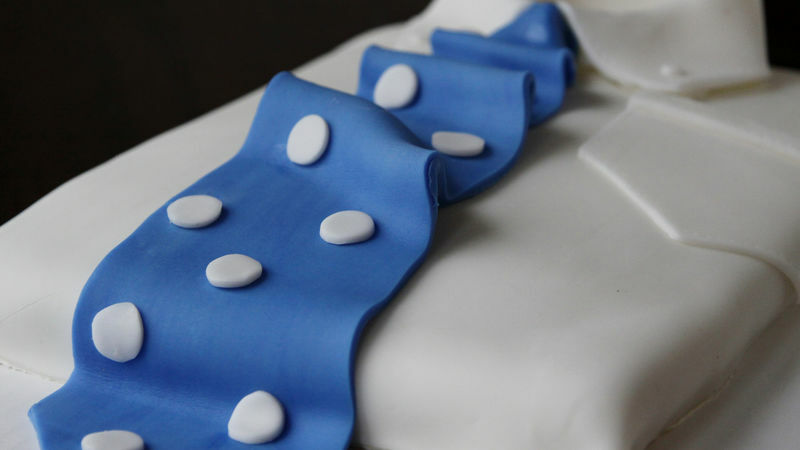 Roll blue fondant to 1/4-inch thickness. Using man’s tie as template, cut out tie. Cut small piece of fondant for tie knot. Drape tie onto cake; add knot at collar. Roll reserved piece of white fondant to 1/4-inch thickness. Use end of large plain pastry tip to cut out polka dots. Dab water on back of polka dots; place on tie. Look for rolled fondant at craft stores, with baking supplies at larger grocery or super stores, or find it online. Use another shade of paste icing color to customize the tie—make it the favorite color of your dad, husband or other celebrant. Create stripes on the tie instead of polka dots for a different look. You can substitute a yellow or vanilla cake mix for the white cake, but a chocolate cake isn’t recommended as it might show through the fondant.